Whether he still sounds like a squeaky door or has reached first chair in the school symphony, your young musician will be delighted with the cello boy personalized Christmas ornament with its big smile and authentically styled instrument. This personalized musical gift is one of a series of musical instruments ornaments personalized to be wonderful mementos. There's room on the back for a special message from you which one of our lettering artists will handwrite or paint in a handsome font. 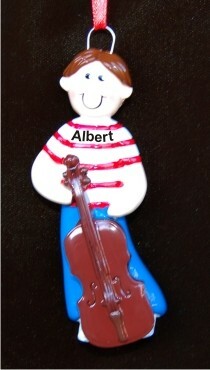 A holiday cord offers easy display of the boy cello player personalized Christmas ornament. Celebrate his effort and all he's accomplishing with this wonderful gift that arrives in our plush velvet gift and storage bag. Christmas Gift Jan 1, 2017 Laurie J.